Cooking is one of the essential life skills everyone needs to learn. Not only will you save money by making your food yourself, but you’ll also be a lot healthier. Millennials spend more money on prepared food than any other generation, which is a problem. This generation is the future, and learning how to cook will ensure the future is healthy. The first step in preparing meals from home is building a kitchen. It’s hard to know where to start and what to buy though, if you’ve never cooked a meal before. Thankfully, we’ve compiled a list of must-have kitchen tools to get you started on your quest to making cheaper, healthier meals from home. The most basic and important kitchen tool to have on hand is a knife. Cheap and accessible veggies are one of the primary benefits of cooking food in your kitchen. There are a lot of knives out there, so we’ve simplified the buying process for you. Below are some of the essential kitchen cutting tools you’ll need to start preparing your dishes. A chef’s knife is one of the most versatile culinary tools you can own. These knives can tackle almost anything you throw at them. For that reason, this isn’t a spot where you want to cut corners (no pun intended). Buy a sturdy, durable chef’s knife that will last you years with proper care. You can cut nearly anything with one of these and it will be your best friend when it comes to dicing and slicing veggies. Spend a little extra here and go cheap on something else. If you purchase a good one, there’s a significant chance this knife will be with you for years. While a chef’s knife should be your priority, a serrated knife is much better for cutting certain things. Bread and tomatoes will squish and break under the pressure of a chef’s knife, so purchasing a serrated knife is the best option here. Unlike the chef’s knife, there’s no reason to spend extra money on an expensive serrated knife. Since it has a serrated edge, you can’t sharpen it. Eventually, it will lose its edge, and you’ll need to buy a new one. Save on the serrated knife and spend some extra on a durable chef’s knife. Without a cutting board, your knives will go to waste. While expensive wood cutting boards are fantastic, a cheaper plastic option is still viable. If you live alone and often cook for one, you’ll probably be fine if you just buy a smaller cutting board for yourself. If you want to be safe, buy a medium-sized board in case you have company over. A little cutting board can be a headache when you’re cooking for more than one person. Now that we have the cutting tools out of the way, it’s time to move onto cooking. You may see some bundles for pots and pans and are wondering whether or not it’s a good deal. 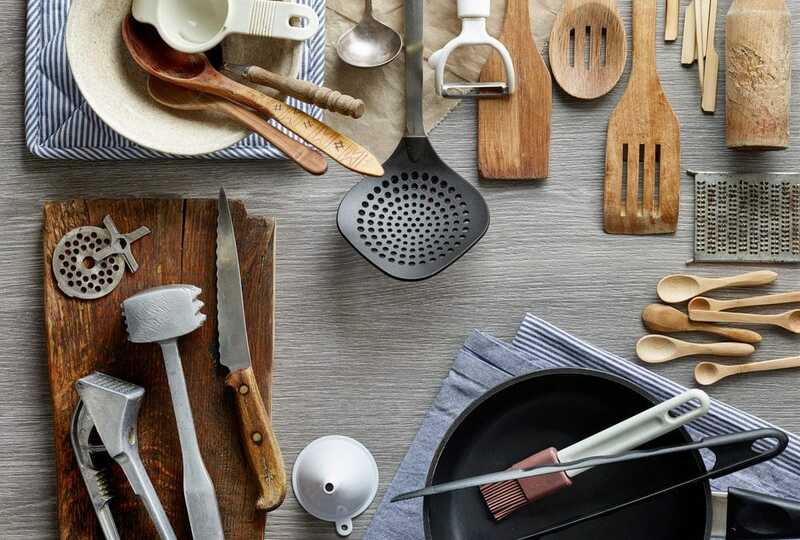 Here we’ll cover some of the necessary cooking tools everyone should have in their kitchen. If you’re making a simple breakfast like scrambled tofu, you may want a nonstick skillet in your kitchen. Trying to cook delicate or sticky items are a nightmare on regular surfaces. You’ll leave a large percentage of the dish on the pan, and cleaning them will require a ton of elbow grease. With a nonstick skillet, you can cook almost anything in them, and they’ll last a few years at least. Since you’ll probably have to replace your nonstick skillet eventually, you probably shouldn’t overspend here, but don’t opt for the cheapest skillet that will allow flakes of the coating to show up in your tofu. A well-seasoned cast-iron skillet can handle almost anything you throw at it. You can make most of your dishes in this pan, so it makes sense to spend a bit more money to get a durable one. Even at the lower price points though, these pans will last a very long time. They take a bit of work to maintain, but the upkeep isn’t as daunting as some like to think. You don’t have to go overboard with the size of your cast-iron skillet, but buy one big enough to handle a meal for multiple people. 12 inches should be perfect and you can probably find a quality option for just over $20. If you’re new to cooking, a slow cooker will be your best friend. These machines offer the opportunity for a variety of easy meals that don’t require much in the way of preparation. You can put your ingredients in the slow cooker, sit back, and eat when it’s ready. There isn’t as much hands-on cooking with these, and they provide you with a nutritious, cheap meal. You can even freeze the leftovers and eat them later. Those who are new to cooking could benefit from a tutorial or two on a slow cooker. These kitchen tools are unlike any other and require some specific instructions to operate them. Once you have it all sorted out, you’ll be good to go. There is a long list of dishes you can cook in a slow cooker, so it will get you out of the routine of eating the same three things every week. For utensils, you’ll need a sturdy pair of tongs, some wooden utensils, a couple of different spatulas, and a strainer. Pasta is the preferred option for anyone who is new to cooking or on a budget, so a strainer is one of the must-own kitchen tools. Other than that, the rest of these are more item-specific. You’ll need a thin spatula for more delicate items, and a thicker spatula for everything else. A flexible spatula goes well with nonstick skillet dishes and baking, and tongs are a must when it comes to frying and grilling. While you can cook a large portion of your meals on the stove, you’ll eventually want to explore dishes that need an oven. For those, you need to have the proper tools to get started. Even if you aren’t trying to bake a cake, you can broaden your cooking spectrum by incorporating some vegan shepherd’s pie or vegan lasagna into your diet. Before anything else, you need to buy the sheets and dishes in which you can put your ingredients. Take the dimensions of your oven before hitting the store. If you don’t you run the risk of buying dishes and sheets that won’t fit. These items will likely cover everything you need when you start baking. You can make complete dishes and desserts on both of these surfaces, and typically won’t need to replace them for a few years. If you’re a new chef cooking for one, mixing bowls aren’t as much of a necessity for you. You should still have one in your kitchen, however, because you’ll eventually want to cook something that requires the mixing of ingredients. At the store, you’ll find both glass and metal mixing bowls. Other than the fact that the glass is a bit sturdier, there’s no reason to pay more for glass over metal. Metal is lighter, easier to store, and more durable. You can spend a little less on these since they will last quite a long time. You can probably find a set for around $20. Measuring cups and spoons are one of the home utensils every kitchen should have, even if you don’t use them. You’ll eventually need to measure something, so it’s foolish not to have some of these on hand. There’s no need to spend too much money on measuring cups and spoons, as one set will probably last you your whole life. Try to opt for a cheaper metal option, as plastic will probably break after continued use. Once you get the basics down, you can start exploring some fancy newer kitchen gadgets. For now, all you need to worry about is having a kitchen that can cook most meals a beginner needs.After purchasing these items, you’re well on your way to cooking from home and having cheap, healthy meals ready for you. Look up some recipes and develop a schedule so you know what to buy when you go shopping. Learn what you like to cook and what you don’t. From there, you’ll have the foundation of a skill that will serve you for the rest of your life.